This is the king size issue for Makin’ It Monday. 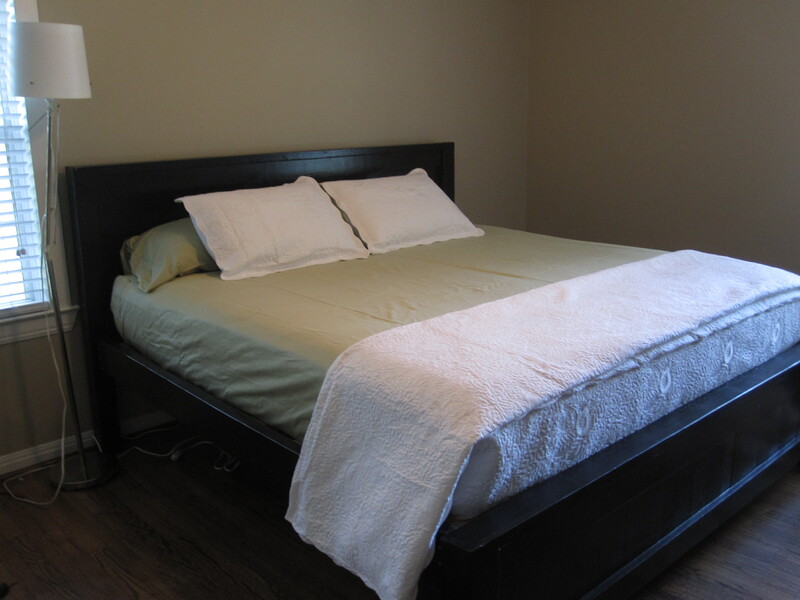 King size bed, that is.When we moved into our last apartment, our bed frame was critically injured. We nursed it back to health enough to use for the time being. When moving out of that apartment, it was clear that it was not going to make the next leg of our journey. The good news is that the major parts of the frame are currently awaiting its next incarnation. Once the transformation is made, it’ll be revealed in the next Wreck It Wednesday. So our dilemma was a serious lack of funds and a king size mattress with no frame. 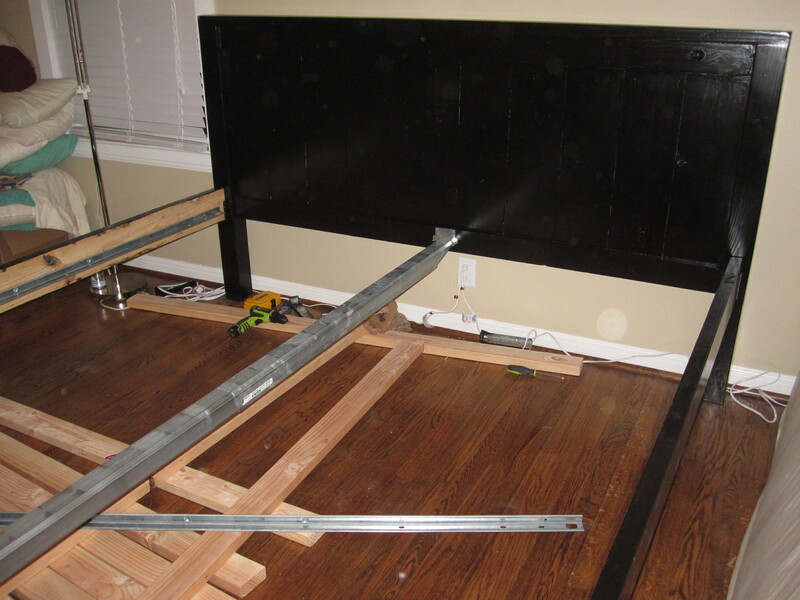 Sure, we could have just purchased a metal bed frame, but we didn’t have a box spring. Besides, since when do I take the easy way out? No, the obvious solution was to build one from scratch. Obviously. 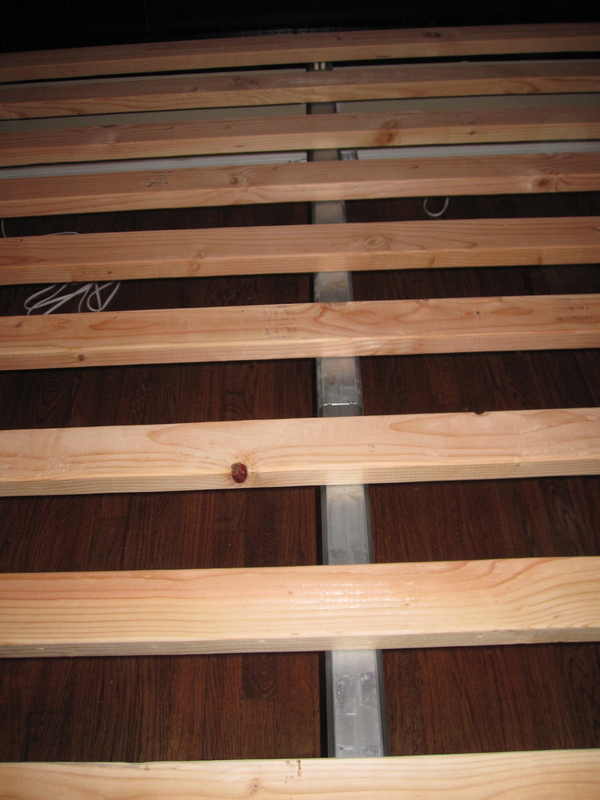 Basically, we took 1″ x 6″ pieces of wood, cut them to the height we wanted the head and foot boards, and arranged them next to each other to the width of our mattress (more or less, basic measurements can be found on the internet). 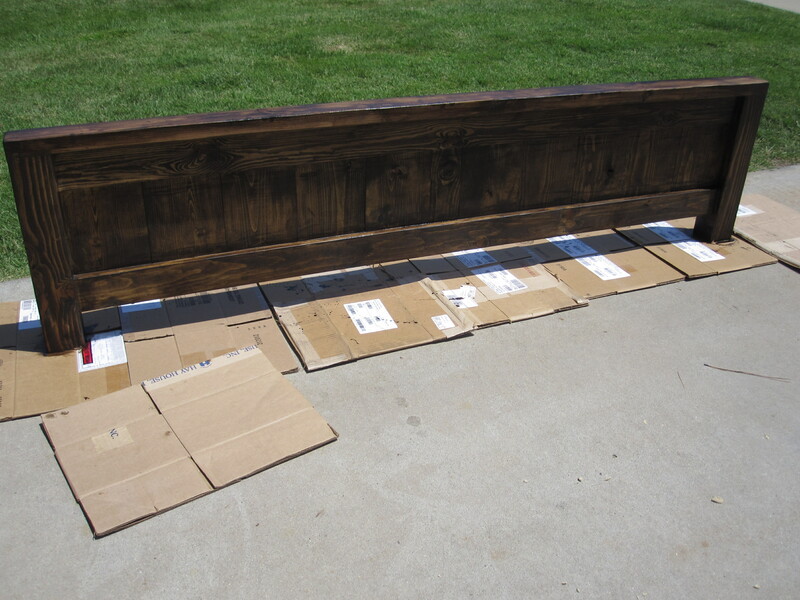 We then sandwiched those boards between lengths of 1″ x 4″ lumber. 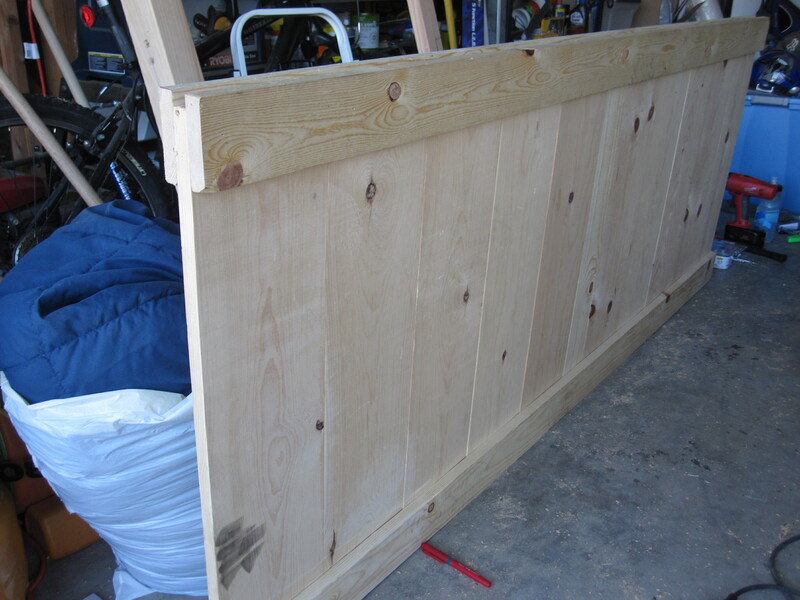 The assembly here is nail (with a nail gun) and wood glue. Here, I attached the legs. Looks simple, sure. I’d like to put out there that it was at this point in the construction of this project that I was ready to chop up my progress and watch it burn in the fire pit I had just built for my best friend (You’ll see that one in a Wreck It as well ::::wink::::) I went through God only knows how many screws, stripping them all. Finally, after some trial and a whole lot of error, I arrived at the solution of using a spade drill bit to bore through half of the leg, then drilling the regular pilot hole through there. Much easier. Bonfire averted. On a side note, I really want my own set of spade drill bits now. If you have no idea what they look like, you can see what I’m talking about by clicking HERE. 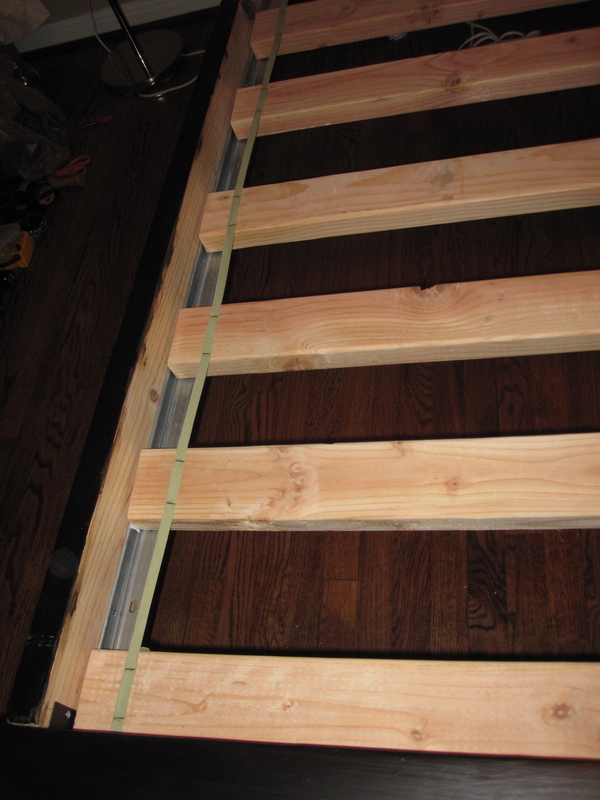 To make the head and foot boards look prettier, I added a top rail cut from a 2″ x 4″ length of lumber. This could have been executed more gracefully than I did, but I have a 1500 mile relocation looming on my horizon and a zillion other things to worry about. I basically just screwed it on and called it good. 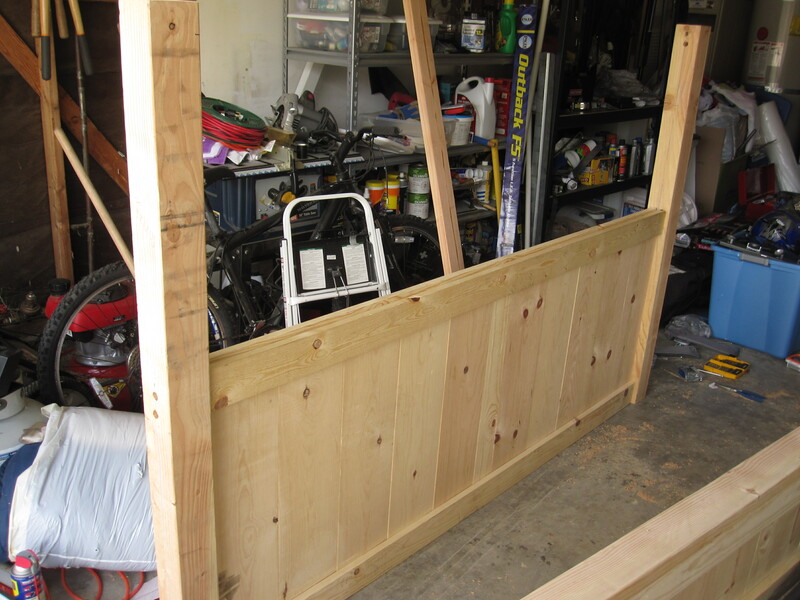 If I had it to do over, I would have used a spade bit and made a deeper notch for the screws to be sunk into, so that the holes could be covered with wood filler, then stained. That would have made for a much more professional product. But who are we kidding, I’m no professional. 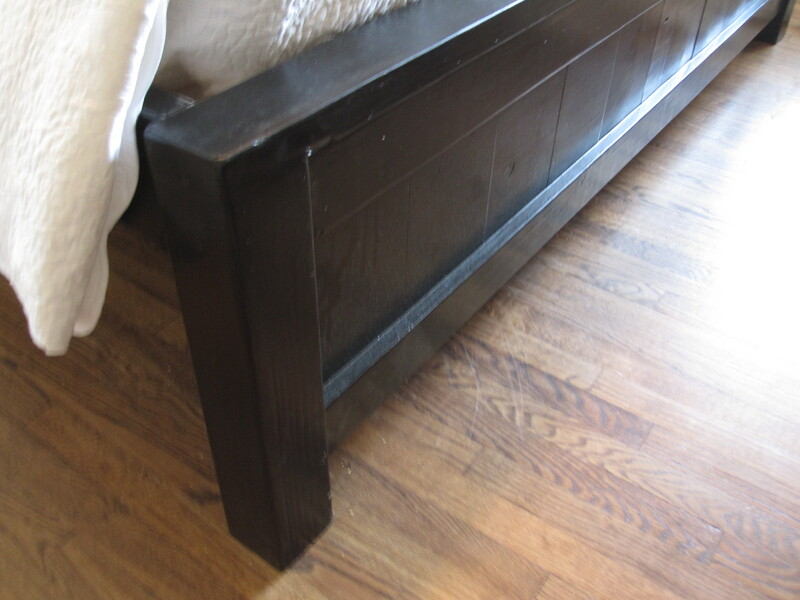 As you can see here, I did added the same kind of top rail to the footboard. I’m not completely unprofessional, I did fill in gaps and what not with a good quality wood filler. 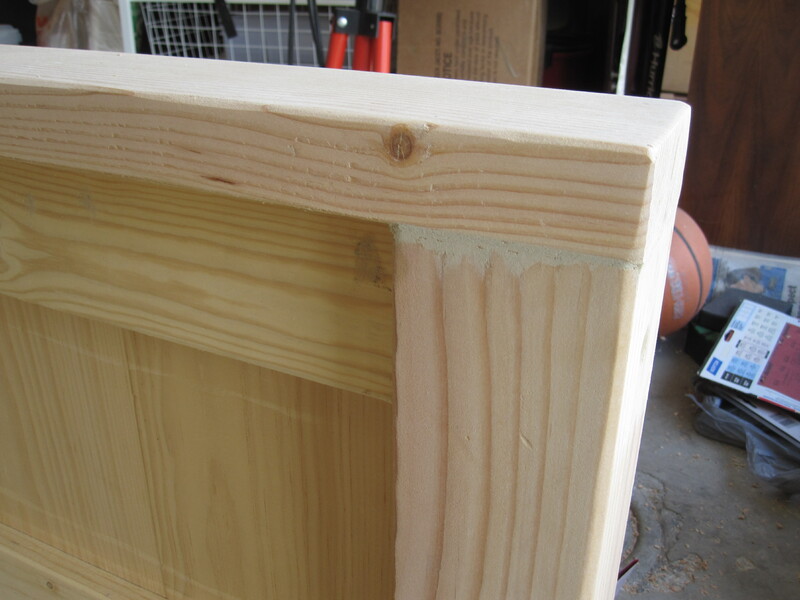 Then the entire thing was sanded down smooth. This, I learned later, is a much much more important step than you might realize. But you will realize it when you go to finish the project with stain or paint. I decided on stain. The same color and finish I used for my coffee table in Issue No. 1. It took a lot of stain. This particular leg of the process was completed in Texas. The humidity slowed this project down to a slow crawl. But it did eventually dry. Eventually. So, funny story. 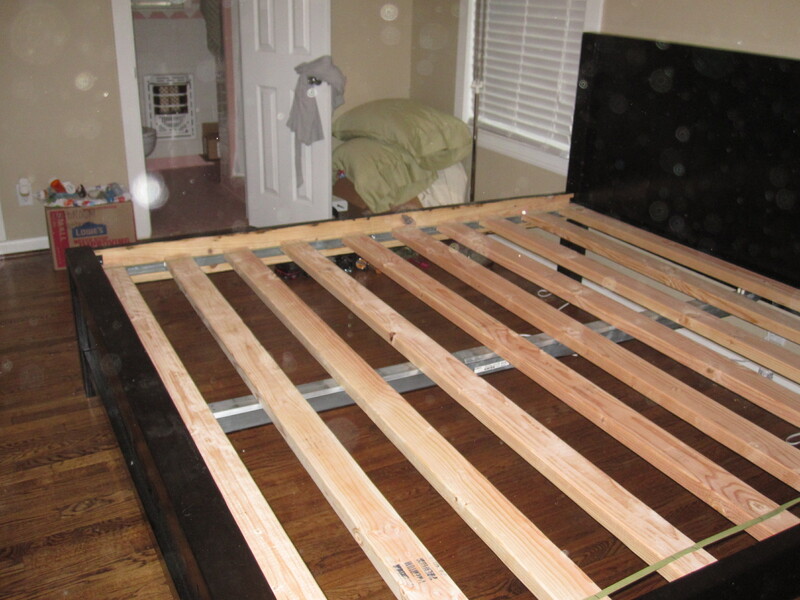 I had some great solutions when it came to the assembly of this bed. Unfortunately, with my being ready to not be sleeping on the floor, I made some less than accurate measurements. The lumber cut for the mid beam was too short. 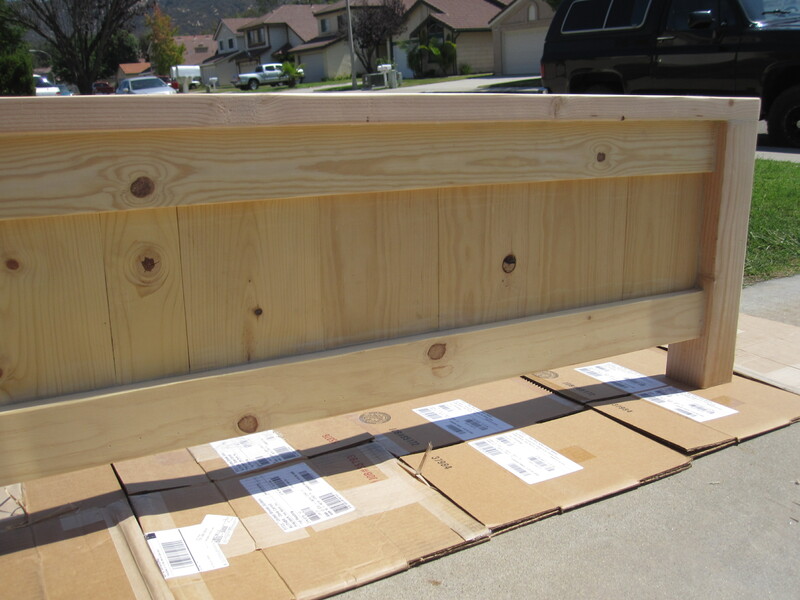 In addition to the short mid beam, the cross beams were also too short to be able to use the brackets we had purchased. 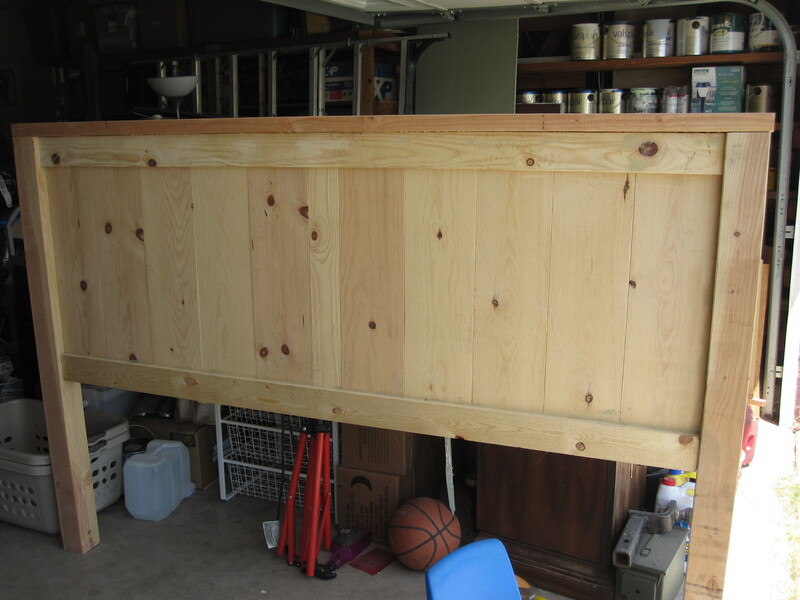 In another blow to my ego, the brackets for the mid beam were for a 2″ x 8″ piece of lumber…I ended up purchasing a 2″ x 4″. 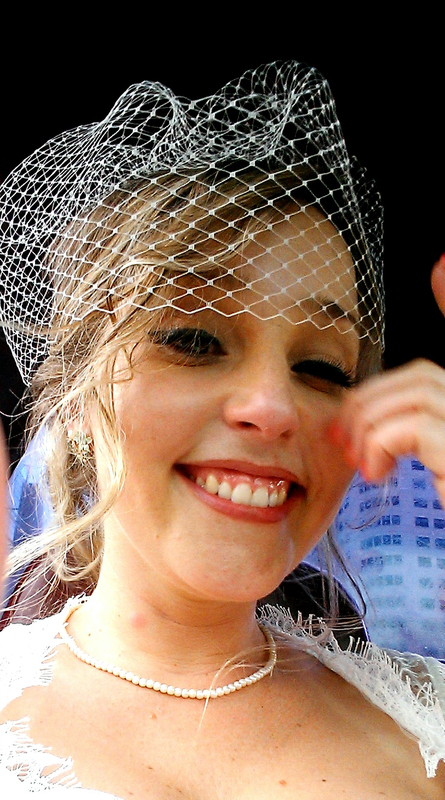 So, I put my thinking cap on. I had no more money to go buy new wood and new brackets. What I did have, like I mentioned earlier about having saved the big parts of my old frame, were the metal side rails that would hold the cross beams despite their being slightly shorter than I’d like. So that solves one problem. What to do for the mid beam? Obviously we have to cannibalize my queen-size Ikea bed frame. Psssh. Luckily the metal mid beam from the Ikea frame is extendable and the brackets and wood I had cut for the king size would work with the queen. So we did a switcheroo, as you can see here. The only thing I had on hand that I could think of as a solution to keep the cross beams from shifting and falling through was bias tape from my sewing supplies and a stable gun. Problem solved. Here it is, ladies and gentlemen. The finished product. Not exactly professional, but tons of character and funny, silly stories to go with it. Color me happy. Please let me know what you think. If you’re thinking about taking on this kind of project, I welcome questions and love to hear feedback!